Surround-sound computer speakers have been around for years. Honestly there was a point when I lusted after them, since I always prefer more immersion when it comes to entertainment. I'd be running a full-room VR rig if I could justify the expense. As time has gone on though, genuine surround has become less important for me and the tech industry at large. Through software and carefully-pointed tweeters and mids, it's possible to get much of the same effect via headphones and soundbars, which have a smaller pricetag and easier installation. The Z606 is one of the cheapest "true" 5.1-channel systems on the market. It's typically $129.99 — less than many 2.1 speakers cost. At that level, it's bound to attract many first-time buyers. On the surface it seems like a pretty impressive package. You get five satellites — three front, two rear — plus a remote and a central subwoofer, the latter with control buttons and an LED display. It also offers Bluetooth 4.2, and you can switch between wired and wireless inputs on the fly. I found installation relatively easy, but here's where the product begins to falter. Apart from Bluetooth it's a fully wired system, which means you'll be stringing trippable, unsightly wires around the room to put satellites in position. That's acceptable at this price level, but does feel archaic in 2019, especially since the wires are thin with bare endings. Another sacrifice is the number of inputs. There's one connection each for 3.5mm, Bluetooth, and RCA — there's no optical port, no HDMI, no AirPlay or Google Cast. There's even no secondary headphone jack, which may be a problem when you want to avoid disturbing family or neighbors. The Bluetooth limitation seems particularly stingy, since many people own several Bluetooth devices, and it's not as if multi-device pairing is uncommon. The speakers would be far more convenient if you didn't have to re-pair. As things are, you can have a computer and a mobile device connected at the same time — it's just that one of them will be wired, and you'll be grabbing the remote to switch inputs. The biggest drawback to the Z606 is power. The speakers are rated at 160 watts peak and 80 watts RMS — a far cry from the 1,000/500 watts Logitech's own Z906 is capable of. The subwoofer is rated at just 50 watts, and can't go any lower than 50 hertz, when better subs come closer to 20. The result was that in testing, I had to crank the volume to hear much of the surround effect, even after using third-party software to boost decibel levels and correct room dimensions. Its sound lacks much punch, and I occasionally encountered high-end distortion. You could certainly do worse than the Z606. It's superior to your Mac or iPad's internal audio, and a notch or two ahead of most entry-level speakers. It's so easy to do better, though. Even if you're not willing to buy the Z906, there are multiple 2.1 options from Logitech I'd choose first, such as the Z623 or Z533. Then there are gaming-quality headphones from the likes of HyperX, Razer, and yes, Logitech —the good ones might cost a little more, but I guarantee it's worth it. 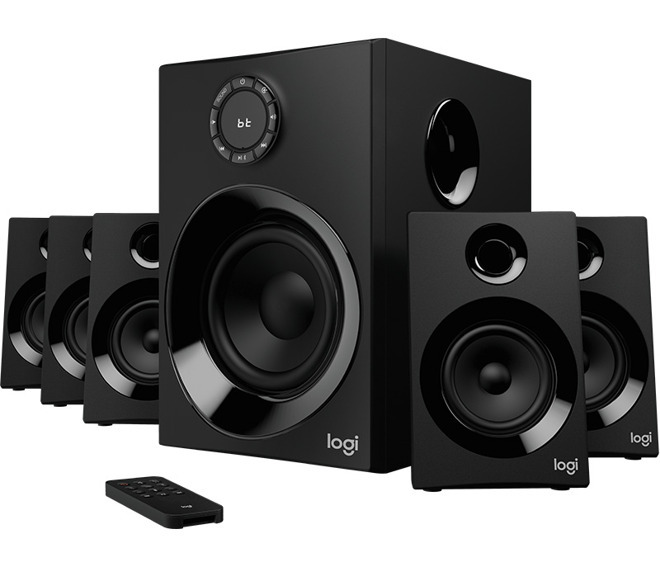 Logitech's Z606 5.1 surround sound speaker system is available from Logitech directly, as well as at Amazon.com. Priced at $129.99, both retailers are including free shipping on the speakers as well.